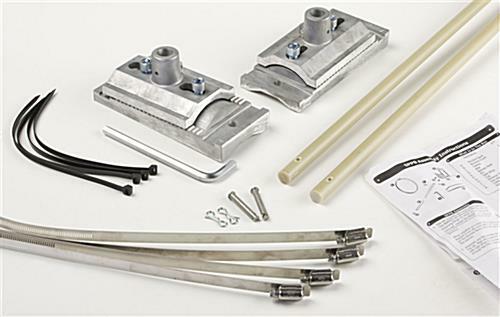 These Banner Flag Bracket Sets have Toothed Adjustments for Controlled Banner Tightening! Promotional Displays for Feather Pennants are Necessary for Properly Showcasing Signage! 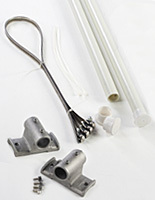 Buy Banner Flag Hardware from GiantPole.us Now and Save with Low Prices! Toothed brackets for controlled on-pole adjustment! Sold without flags so customers can mount their own custom banner! Exclusive brackets and screw-gear bandings affix to virtually any upright! Includes all hardware needed for 30" wide flag display! Banner flag hardware displays outdoor street signs. These fixtures are designed for extended use on the exteriors or businesses or along main routes. The banner flag brackets, such as these cast aluminum mounts, include all the necessary components for a single-winged display. Promotional pennants are often used by businesses as marketing and advertising tools. Athletic complexes hang banner flag brackets and signs to decorate tailgating areas with images of legendary players, playoff appearances or local attractions. These sign frames are a common sight in the parking lots of retail stores, where they promote sales or clearances. Museums, zoos and aquariums use these banner brackets alongside feather pennants to tell patrons of new exhibits, animals or available seminars. Hotels, resorts, golf courses, schools and universities spruce up their grounds with graphics. Communicating information on signs within communities is another use for these banner flag brackets. Farmers' markets, street fairs, live performances, fundraisers and other events can be printed on vinyl or fabric signs, then advertised on a light pole. 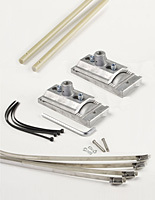 These street mounts, banner flag brackets have many great features. The heavy-duty construction will endure years of use. Brackets come with adjustable hardware. Teeth adjustments enable the graphic to be adjusted up or down up to 1-1/4", even after it is mounted to the street pole. The toothed banner flag brackets ensure a taut pennant! Two 33-1/2" wide poles are manufactured from fiberglass to withstand winds and prolonged outdoor usage. 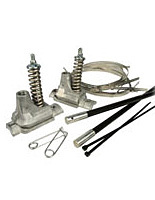 Each of the bracket sets affixes to a street light using screw gear bandings. 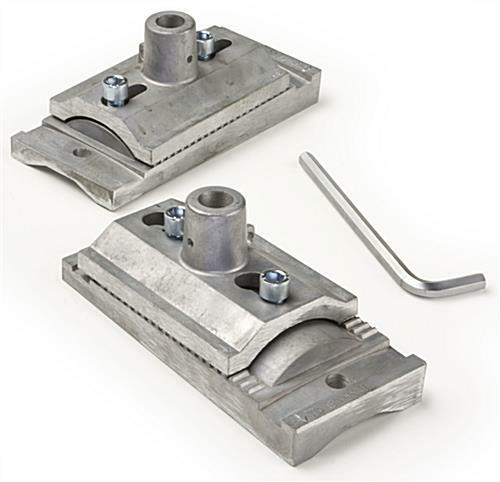 These are fully adjustable, so the hardware will fit on uprights of various shapes and sizes, including square or tapered light posts. 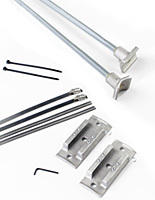 Also included with the banner flag brackets are instrucion sheets, four UV-resistant zip ties (two needed for each street flag), and a large Allen key.